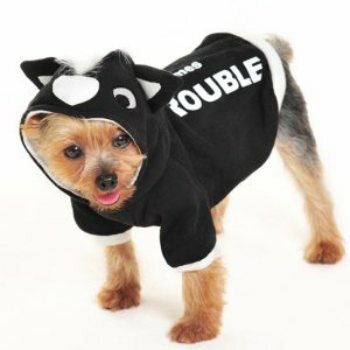 Cute skunk costume for dogs features a white Mohawk hood and "Here Comes Trouble" printed across the back. Designed to be a Halloween costume for dogs or an everyday dog sweatshirt. Made with 100% cotton and has a convenient leash hole.